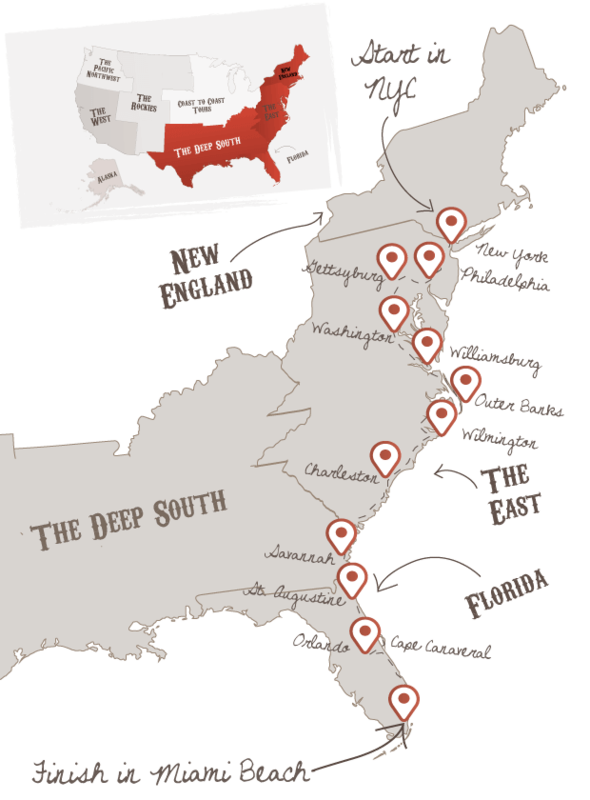 The Atlantic coast is dotted with amazing places to visit and our 21-day road trip visits them all. Starting in New York City in the north, you’ll cruise south all the way to Miami. Experience buzzing cities, historic landmarks and some of the east coast’s best beaches. Enjoy four amazing days exploring the world’s greatest city. An epicentre of the arts and America's true dining and shopping capital. New York City wears many crowns and spreads an irresistible feast for all. Only the Big Apple can provide so much packed into five boroughs. If you've got the energy and arrive early enough we recommend starting with an open top bus tour this afternoon to get a feel for the different areas of the city. Not only is it good value for money but it'll help familiarise yourself with the layout. Your Road Trip Pack is full of recommendations of where to eat and what to see and do. Highlights today could include 5th Avenue shopping, Grand Central Station, the New York Public Library, Bryant Park, Times Square, Broadway and the Rockefeller Centre - just make sure you leave time to visit either the Top of The Rock or The Empire State Building as the Sun sets, to witness the city’s lights come alive in the Big Apple. Philadelphia is often overshadowed by its noisier neighbours - New York to the north and Washington DC to the south. 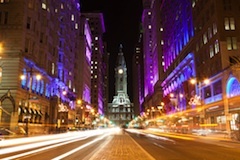 However, we think Philly holds it own in this illustrious company, boasting just as much history and comparable shopping, nightlife and museums. And where else in the world can you recreate the famous scene in Rocky, the steps of the Museum of Art await. A full day to explore Philly. Take a Big Bus Tour - Now you can experience the unique history and beauty of Philadelphia from the top of an authentic London double-decker. Enjoy the most spectacular views of the city while guides entertain you with fascinating facts and fun stories about Philadelphia and the people who help make the city what it is today. Get on and off as you please, this is a great way to explore the city. Drive to the Capitol, visiting highlights along the way like historic Harper's Ferry and the lovely Loudoun Wine Region. After checking into to your DC hotel, we recommend you explore Georgetown for the rest of the day. This is a charming corner of the city, and well worth a visit to explore the boutiques, restaurants and charming streets that surround the famous university. This historic part of America forms a triangle between Williamsburg, Jamestown and Yorktown. Williamsburg in particular will educate you in the lives of the early English settlers that arrived in the early 17th century. Travel west of here and you’ll discover the wealthy homes of former slaveholders. The worlds longest stretch of barrier islands can be found in North Carolina. A surfers paradise and a sea captains worst nightmare, the Outer Banks form a 150 mile barrier parallel to the mainland. Skinny and fragile in places, the islands are dotted with lazy inns, wild horses and lighthouses. Spend the morning exploring the beaches and lighthouses of the Outerbanks as you cruise south along scenic Highway 12. Should you decide to take the coastal route to Wilmington then we'll book you onto two ferries that link the roads in this area. Spend the afternoon and evening in Wilmington, which features a scenic Riverwalk lined with boutiques, cafés and vibrant nightlife along the Cape Fear River. The city’s historic charm comes from its brick-lined streets, Victorian and antebellum architecture, and mossy oaks. Cruise down to beautiful Charleston. Steeped in Colonial and Civil War history, Charleston is a perfectly preserved and friendly southern belle of a city. Visitors fall in love with its grace, charm and historic value which is usually enjoyed in the warmth of the South Carolina climate. Cobblestone streets, colourful houses and historical buildings make it a unique city. Spend a full day discovering the history and architecture of Charleston. The city is in a mini renaissance at the moment, attracting new restaurants and culture into the mix. As always, your personalised Road Trip Pack will detail all the visitor options that are available, such as Magnolia Plantation, Charleston City Market and so much more. After spending two memorable days in this beautiful city, Charleston will stay with you for many a year and is an ARTCo favourite. Cruise down to Savannah in the morning, exploring beautiful beaches as you make the short drive south. Be sure to work up an appetite en route, Savannah is home to many great BBQ restaurants and the famous Leopold's Ice Cream Parlor. Such a charming and friendly city be sure to check out the riverfront area for bars, restaurants and riverboat cruises. Your personalised road trip pack has plenty of suggestions. Head further south to Orlando. This former orange-grove is infamously known now for Walt Disney World. The resort is the size of Greater Manchester alone and boasts an incredible range of theme parks and water parks. The parks are continually evolving and Orlando is now a mecca for theme park enthusiasts. Make sure you check out the "big two" of Walt Disney World and Universal Orlando, a whole world of fun. Miles of sandy beaches which are backed with spectacular Art Deco hotels. South Beach is the perfect base for your three-night stay. A great place to cruise around, walk the boardwalk or enjoy a meal while you people watch. Forget Miami Vice, this area is classy and the hotels are amongst America's best. Miami is also packed with great shopping options from giant malls to the trendy boutiques on Collins Ave. Whatever, your tastes or budget - Miami has retail therapy covered and a great place to get in some last minute retail therapy. Spend the last day and half relaxing by the hotel pool or chilling on the beach, check out the cool life guard huts that watch over the Atlantic coastline. It's been an action packed 3 weeks, so why not rest up for a while to recharge your batteries before flying home on Day 22. Don't forget to check out this road trip's Itinerary tab to see more amazing pictures from our ‘Ultimate East Coast' tour. You'll also be able to read a little bit about what you'll be getting up to on each day of this incredible road trip adventure.